On Thursday, August 28, 2014, the Chabad Jewish Center of Wyoming will host what is sure to be an inspiring evening with Mrs. Eva Schloss as she tells her fascinating story. Mrs. Schloss is the step sister and childhood friend of Anne Frank. She is an enthusiastic advocate for helping society understand the meaning of an existance without prejudice or bigotry towards any human being. Governor Matt Mead is proclaiming August 28, 2014 Wyoming Tolerance Day. The lecture will be held at the Center For The Arts, located at 265 S. Cache Street, in Jackson and will begin at 7:00 p.m. A personal book signing will follow the lecture. I was born in Vienna,Austria 1929. As one of many Jewish families, we were faced with persecution, but were lucky enough to be able to flee the country, first to Belgium and then in 1940 to Amsterdam, Holland, where we met the Frank family. Following the German invasion of Holland in 1942 and the arrests of many Jews, our family had to go into hiding. In May 1944 we were betrayed, captured by the Nazis and sent to the death camp Auschwitz. In January 1945 my mother and I were liberated by the Russian army. We were evacuated eastward, travelling with the Russian army as far as Odessa. We had to wait until the war ended in May 1945 to be repatriated to Amsterdam. There we learnt of the tragic deaths of my father and 17 year old brother in Mauthausen. The loss of my family haunted me and made it difficult to lead a normal life again. I had to resume my education and finished school at 18, and went on to study History of Art for a year at the University of Amsterdam.In 1951 I began training as a professional photographer in London, where I met Zvi Schloss. We were married a year later and made our home in London, during which time I was working in a commercial studio. In 1953 my mother married Otto Frank the widowed father of the diarist Anne Frank, making me her posthumous step sister. Zvi and I had our first daughter in 1956, and we were blessed with two more over the years. From 1972-1997 I owned and ran an antiques business, in that time the girls had grown up and had children of their own, making us the proud grandparents of three girls and two boys. Since 1986 I have become increasingly active in Holocaust education by speaking in schools, universities, prisons and public meetings. I co-founded the Anne Frank Educational Trust in the UK. My first book, Eva’s Story, about my experiences during the war, was published in 1988. It has been translated into eight languages. 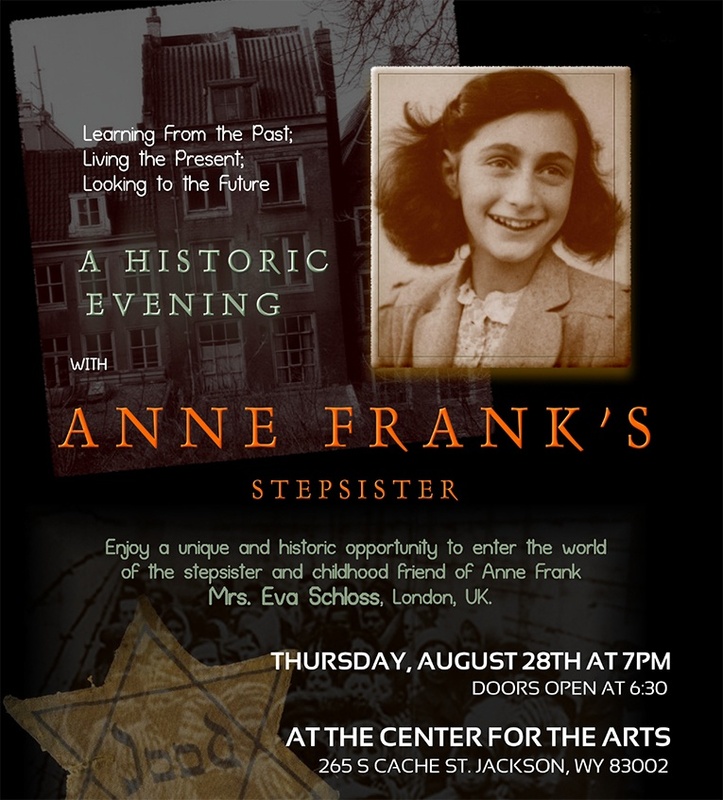 In 1995 I co-operated with U.S. playwright James Still in the creation of an educational play And Then They Came for Me, Remembering the World of Anne Frank, dealing with four teenagers in the Holocaust. The play is widely performed in England, U.S.A, Europe and Australia. I am attending many of those performances so I can answer questions after the shows. In connection with these educational activities, I received an Honorary Doctorate in Civil Law from the University of Northumbria in 2001, and from the University of York in 2004 for Education. In 2005 I wrote my second book, The Promise, aimed at younger readers, telling the story of my brother Heinz. In 2008 the U. S. House of Representatives honoured me in the Congressional Record. In 2012 I was awarded an MBE by Prince Charles for Holocaust Education. In 2013 I published my third book, After Auschwitz, describing the impact of my experiences on my life and that of those around me. Troopers from Wyoming and South Dakota met up on August 5th at the Wyoming / South Dakota state line for an informal get together and lunch. With the Sturgis motorcycle rally this week in South Dakota and the popular “Ham and Jam” event in Wyoming today, troopers from both agencies are staying busy with the increased motorcycle traffic in both states. Highway safety is the focus during the events and additional troopers have been sent to the areas to increase visibility and enforcement. As motorists enjoy the beautiful scenery the two states have to offer, we remind you to please drive and ride safely, wear your seat belts and helmets and to never drive or ride drunk or buzzed. The Lander Art Center opens Near and Far, a paintspective by Jon Cox Friday, August 8th from 6-8pm. His work represents both the vibrant life in Wyoming as well as the places and people he counters on his travels around the world. Wildlife and the everyday is juxtaposed next to urbanscapes and the exotic creating a reminder of the extraordinary diversity life offers and asks us to experience. 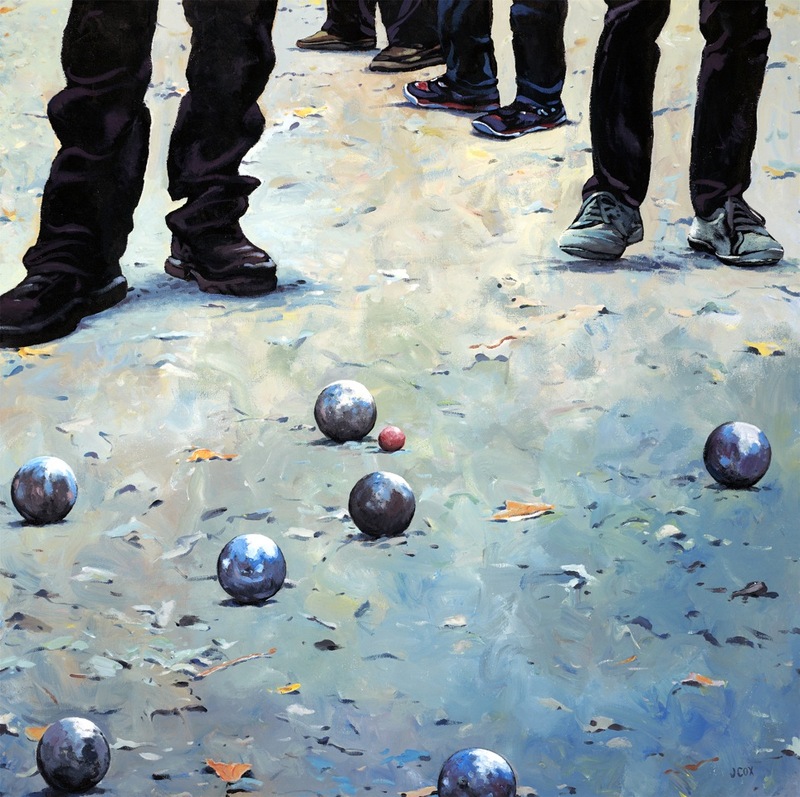 “This is sort of a starting point for me, a ‘perspective’ gained from experience and knowledge of painting. I paint only what and in the way I want, but like the interaction of discussing how these works came to be with others. Out of this comes new ideas and true growth. Come travel outside your door and around the world in this exhibition that takes the viewer near and far. Openings are free and open to the public. “For centuries, artists have been challenging their intellects and skills by paying homage to the painters who preceded them. American realist painter Jenness Cortez has emerged as the 21st century’s most notable exponent of this facet of art history. Her masterful work gives Cortez solid footing in the colorful lineage of artists who have appropriated vintage images and woven them into their own distinctive, recognizable fabric. “Cortez starts with an iconic masterwork and surrounds it with meticulously rendered book covers, photographs, sculpture, antiques and other objects with cultural or historic significance. Each intricate Cortez creation challenges the viewers’ intellectual curiosity and celebrates the sheer pleasure of beautiful painting. A key to the impact and success of these paintings is the skill with which she achieves meticulous likeness of everyday objects. For collectors, these works are marvels to behold. “It is our pleasure to offer this new collection of master works by Jenness Cortez for your perusal and we invite you to contact us with any inquires. Contact Trailside Galleries on their website, www.trailsidegalleries.com, at 130 E. Broadway in Jackson, or by calling 307.733.3186. SINKS CANYON: Photography Raffle Helps The Park — Buy Yours Today! The annual Sinks Canyon State Park raffle is going on and people are encouraged to buy a raffle ticket to win one of three beautiful pictures. Three fully framed and matted photographs by award winning Lander photographers Scott Copeland and Gene Schmidt are being raffled off to help raise money for new displays in the park visitor center. 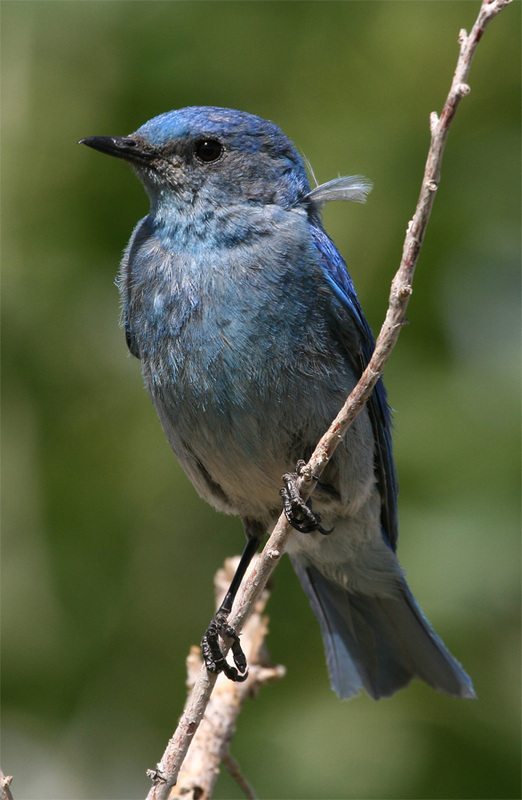 Schmidt donated a photo of a bright blue Mountain Bluebird and a red and cream Cassin’s Finch. 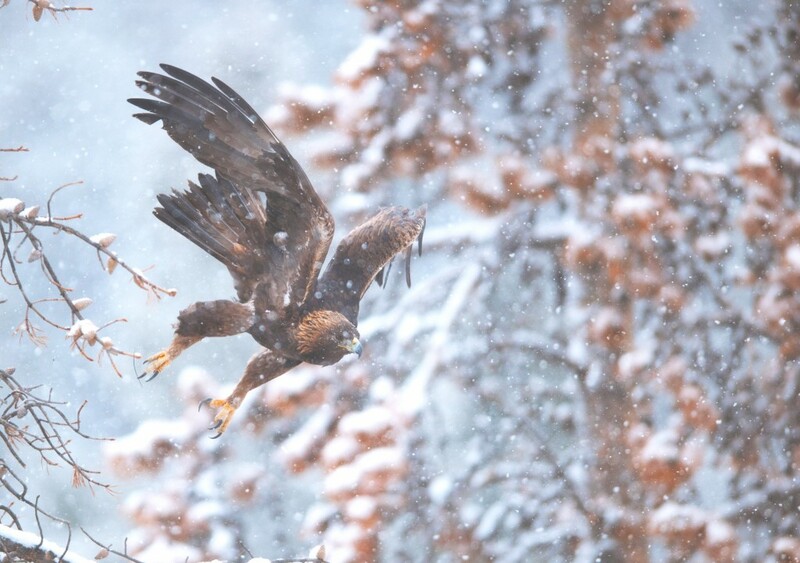 Copeland donated a soaring Golden Eagle flying through the snow in the canyon. 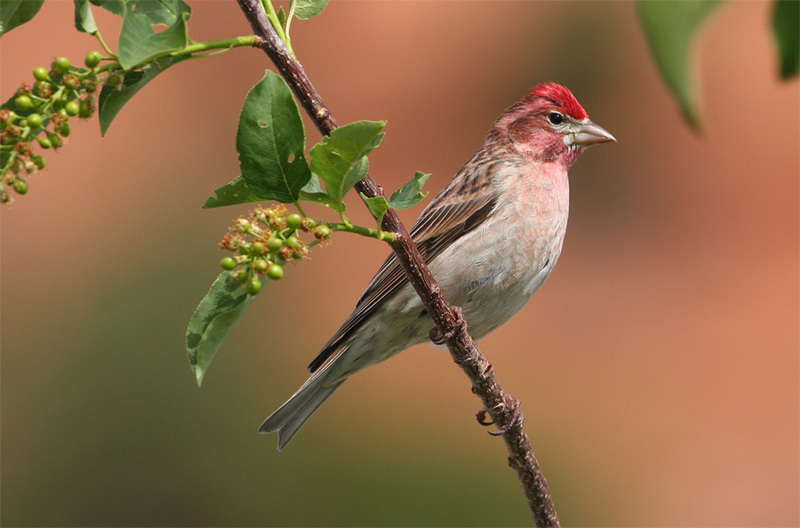 Tickets are available at the park visitor center. One raffle ticket is $2 or buy six for $10. The drawing for the winners will be held on Labor Day. 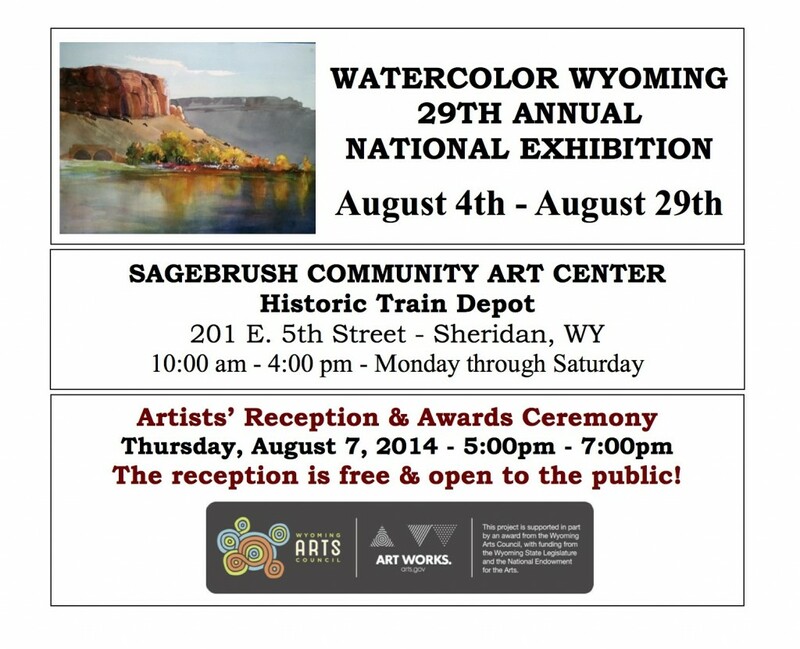 The visitor center is open Monday through Sunday from 9 a.m. to 6 p.m.
Wyoming Watercolor Society (WYWS) will host the Watercolor Wyoming 29th Annual National Exhibition in Sheridan, WY August 4th through August 29th. Please join us at the awards ceremony and artists’ reception on Thursday, August 7th from 5-7pm at the Sagebrush Community Art Center located in the Historic Train Depot – 201 E. 5th Street. 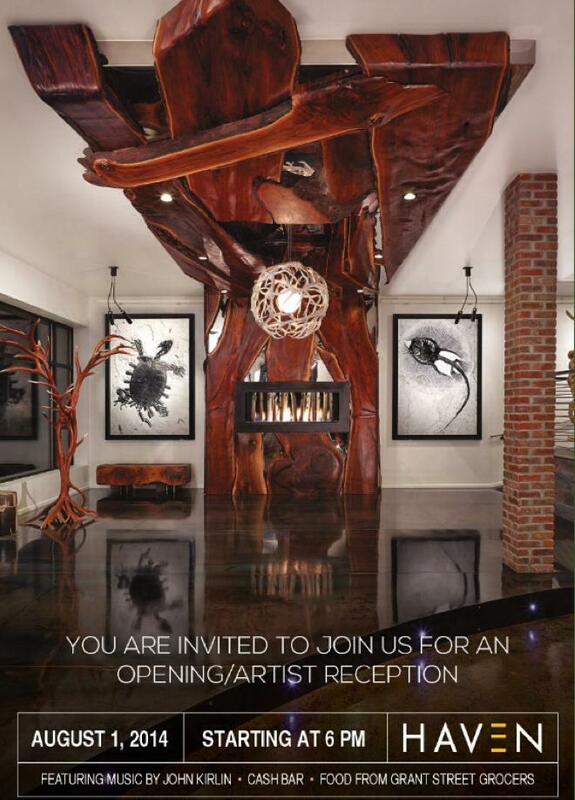 This is a free reception and is open to the public. Refreshments will be available. WYWS has hosted both an Annual National Exhibition and a Watercolor Workshop in the state of Wyoming for the past 29 years. The workshop instructors are nationally known and have brought abstract, realism and experimental watercolor styles to the participants. Students attending have represented states across the nation traveling as far away as Canada, Alaska, California, Nevada and Florida. Artists are juried into each year’s show and compete for prize money, national recognition, and a chance to gain signing membership status. WYWS supplies a format for artists to learn, compete and have fun. This year WYWS is showcasing 46 paintings done by 27 artists from 13 states. Nancy Baldrica from Avondale, Arizona will teach a 5 day workshop August 4th through August 8th at the Big Horn Women’s Club. Spaces are still available for the workshop. The fee for Wyoming Watercolor Society Members is $350 and $400 for nonmembers. Membership is open to all watercolor artists 18 years of age or older. New memberships are $35 for a year, then $25 a year for renewal. For more information please call Karen Myers at 751-6411 or visit the website at www.wyomingwatercolorsociety.com.